My 1st week of marathon training has started. I'm not actually running a marathon in the fall. I'm running Runner's World Half Marathon and Festival, which is 4 races over three days for a total of 26.2 miles. 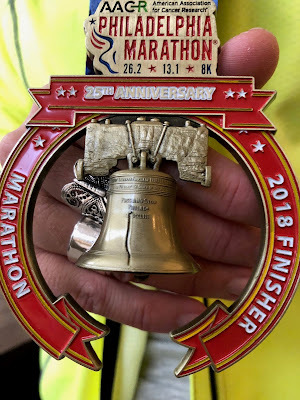 A few weeks ago I was so frustrated, with about 5 different marathon plans sitting in front of me. I knew a cookie cutter plan wasn't for me. I knew from previous experience, I wouldn't follow one the way I should. I decided I was going to create my own plan. I was still lost though because there are so many running workout you can add to a plan; track runs, hills, repeats, long runs, race pace, fartleks, cross training. I was feeling the pressure of putting together a plan that I would actually follow too. I love to have a schedule but I'm not good on the follow through. I think I can skip a day and make it up later. I slacked off on my half marathon training and even though I had a race I enjoyed, I didn't race that run at all. I had about 2 months of running with no specific training included. I want Runner's World to be different. What to do? I did what I always do when I have a running question, I reached out to my awesome friends-in-my-phone Sub Club for information on running coaches. I was hoping to find someone to help me with a personalized plan. After talking to a few people, I decided to reach out to someone that was recommended to me for a running coach. The biggest change for me this week is that I feel like I can't blow off a workout. I'm responsible for reporting my times, so I have to put the work in. We are both on a one month trial with each other to see if we're a good fit. I especially like that I didn't have to think about what to do this week. I just looked at the schedule, did it, and reported my results. My workouts this week were based on my pace from my 10k, which is a pace I never thought I'd be able to reach or sustain. This week I ran a baseline, one mile time run on a track. My hubby helped me to time this run and as always, was a huge encouragement for me while I was running. I was starting to really slow down the last loop and I could hear him yelling at me from across the track. I couldn't tell what he was saying but it helped me to pick my pace back up. I found out after, he was yelling at me to pick it up so I could hit an 8 minute mile. I ran the mile in 8:14. I can not wait to see what my next timed mile will be. My long run this weekend was at a pace about 1-1:30 minutes faster than I normally run them. It hurt and felt great at the same time. I could feel I was stronger over the 8 miles than I thought I was. This is going to be an interesting time trying to figure out just how fast I can go and for how far. I have some very long term goals in my mind that at times feels like they just might be attainable. I'm hoping to share my progress as I go along, so I too, have a journal of how I'm doing. As I progress I'll share some of my goals but for now I just want to concentrate on getting stronger and faster.